Apple announced on Thursday, January 19th their new developments in the textbook arena – iBooks2, iTunes U and E-Book Creator for Mac computer. Upgrade of iBooks to iBooks2 (free, requires just an upgrade, not a new app) allows greater management of multimedia textbooks with features of text, images, videos, animation and audio. Used with the Speak or Voice Over accessibility features, text to speech is available to access print in iBooks2. Accessible instructional media on your iPad, – truly amazing providing access, visual and wonderful multimedia for your students (if the text-book is being offered – or you can create it!) – talk about Universal Design! If you haven’t already downloaded iBooks to your iPad or iPhone/iPod, its time to do so as children’s books along with textbooks have the potential of being more multi-media rich also! 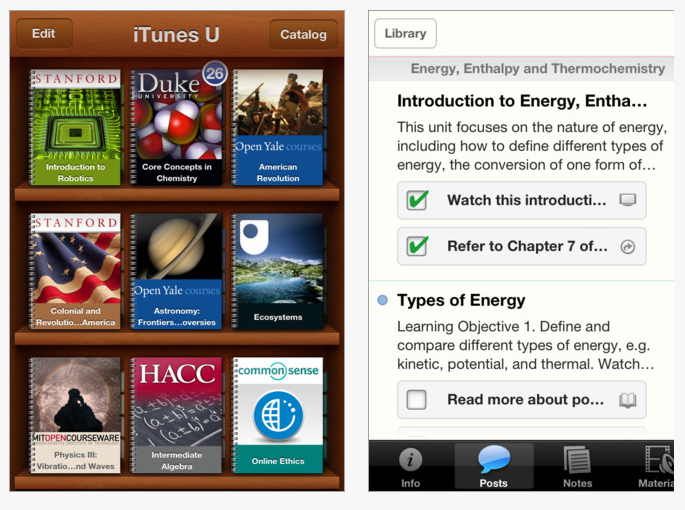 Apple also announced their new iTunes U app – a free app coursework, books, videos, presentations already available in iTunes but now easily available in an app on the iPhone and iPad. Currently it has open sources text materials, videos, presentations, audio and books primarily for post secondary students. 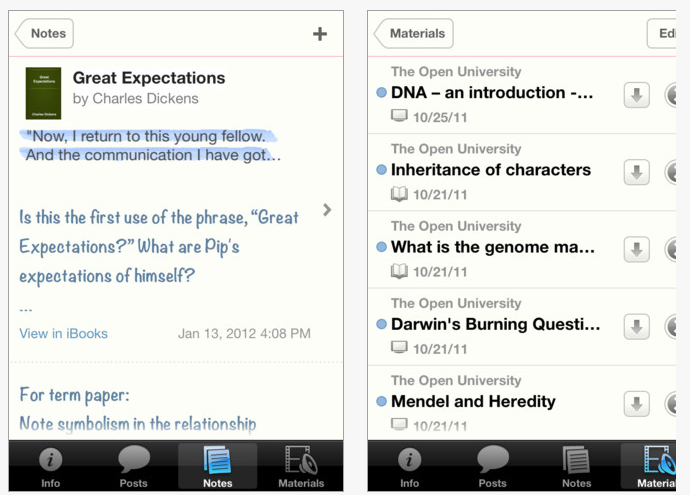 The app has note taking options and offers access to associated materials within the app. iTunes U certainly has the potential for offering any kind of educational multi-media for young and old. This is an amazing resource if you want to brush up on anatomy, psychology – almost anything – for free! I have enjoyed downloading podcasts from iTunes U in the past to listen to while driving. 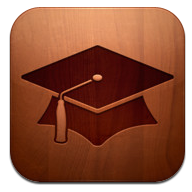 The iTunes U app makes this even easier without the hassle of downloading into iTunes. Another new development for the Mac computer is a free E-Book Creator app. Only for the Mac computer, the E-Book Creator will allow making e-books using this app. Use the link for more information on the Mac app. I am really wanting a Mac computer to be able to use this app to create content for students for use on their iPads! Here is a Mac World article for more information on Apple’s new developments. With the accessibility on the iPad and multi-media content for students with special needs I believe we will see a plethora of educational content still arriving for the iPad. As a school based OT and AT specialist this unfolds a whole new use of the iPad for students with learning disabilities or students needing modified content for their classes. More great tools for your OT iTool Kit! This entry was posted in App Reviews, Apps for OT's, eBook Creating, High School, iPad, Learning Disability, Middle School and tagged App Review, iPad, Learning Disability. Bookmark the permalink. I have to say when I was following the Apple news release on Thursday I was so excited. What a game changer it would make for special education especially. Such customization and individual planning that could be carried out from year to year once a teacher or therapist created each book. But then I became completely deflated when I learned that you need to have a Mac to do it – ibook author is only available on the mac. I was hoping you could do it right on the iPad. I can hope that it will happen in the future. Will have to wait and see how it all pans out. Would relieve a lot of back pain in students if textbooks took off on the iPad. Yes, unfortunately the easiest way is to use their new app or use Pages on the Mac. On the day it was announced I attended a workshop on creating ePub books in Pages – it is great on the Mac. To do a similar ePub book, Calibre is recommended on Windows computer. When I find time I am looking forward to getting back into Calibre again (did that a while ago but it is on my list to do…) or hunt down a Mac. I rather doubt that you can embed as much media into Calibre as you can when you use Pages. More hopefully in another post! Thank you – Your Therapy Source for your comment – I enjoy your website and all its resources- WOW!